In the demon world an epic battle rages between the shadows and hunters. Their are civilians caught up in the middle who have their own goals. In Shadow Hunters you and your friends will take on these roles in a desperate fight to the death. However, you will have to determine who is on your side and who is the enemy! 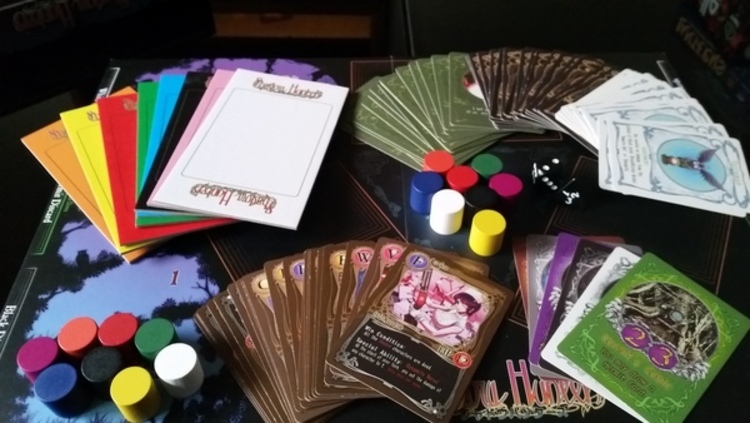 Shadow Hunters is a secret role game with a distinct manga/anime feel to it. This is a great high player count game that seems to have slipped under a lot of peoples radar sadly. 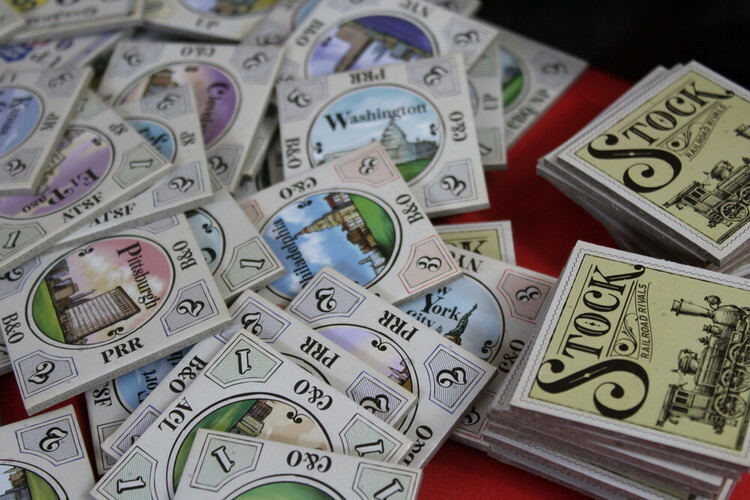 Role cards are distributed in secret to all players and placed face down on their player board. However many players there are, there will always be an equal number of shadows and hunters, the number of civilians will vary. For example in a 7 player game thete will be 2 shadows, 2 hunters and 3 civilians, in a 6 player game there is two of each faction. Each players places one of their wooden pieces at zero on the damage track and one in the middle of the board and the game begins. 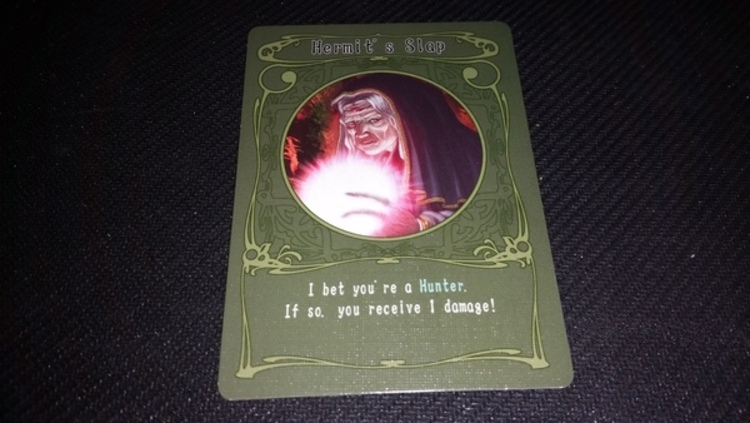 Each character card contains a fair bit of information. 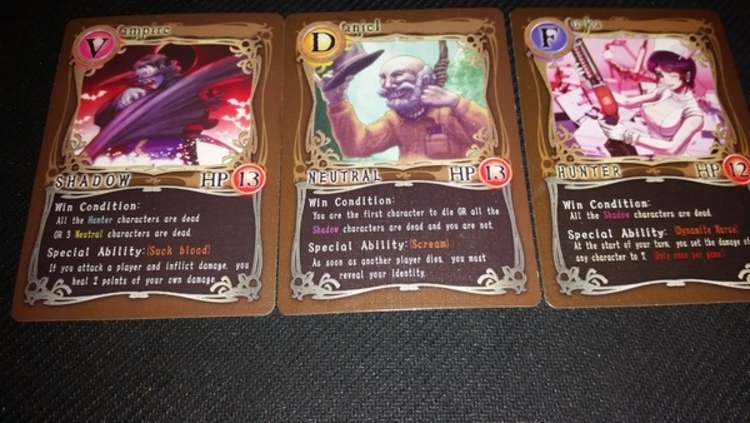 The name of your character is at the top, their affiliation is middle left, hit points middle righ and their win condition and special ability is at the bottom. To move your character you roll both dice, add the total and move to the allocated area, if you roll a seven you may move to any area you choose, you must, however, move whenever you roll the dice so roll again if you roll the number you are already on. You may then take the action on the area card. There are six different area cards, each with a different action. The black ,white and green spaces (Cemetery, Church and Hermit's Cave) allow you to draw a card of the same colour (more about cards in a bit!). The Underworld Gate allows you to choose a card pile to draw from, The Erstwhile Altar allows you to steal a piece of equipment from another player and finally The Weird Woods allows you to either deal two points of damage to someone or heal one point of damage. White and black cards are either single use or equipment that stays face up in front of you. Green cards help you identify which side other players are on. Read the card and pass it, face down to another player of your choice who should follow the instructions on it. For example, this ca, you would pas to someone, if they took a point of damage they are a hunter, if not they are either a shadow or a civilian. At the end of your turn, you may attack any player in the same area as you. You simply roll the two dice and deal an amount of damage equal to the difference between the two dice. If the two dice roll the same number your attack is unsuccessful. Your character dies when they take damage equal or more their health value, when that happens reveal your card, you are out of the game. If any of the win conditions on your card are fulfilled, immediately reveal your card as the winner, it is however possible for multiple characters to win the game at the same time. This is a great and pretty simple game, though the role deduction makes it great fun with the right group. The art on it is lovely and the game board has a lovely finish. 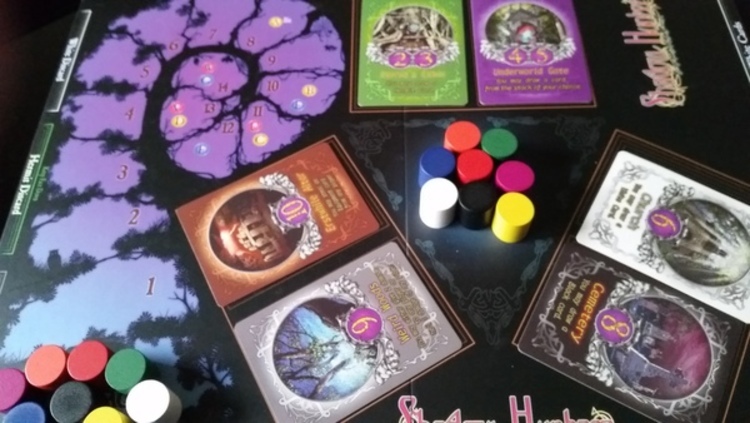 One major problem with this game is the player pieces, the colours on the boards and tokens just don't match (the pink board has purple tokens) and some of the colours are tough to tell apart (the black and dark blue for example ) That said, this is a great gem of a game and plays up to eight players, which alone makes it worth having. The accusations and promises that occur during a game make it a great social game.